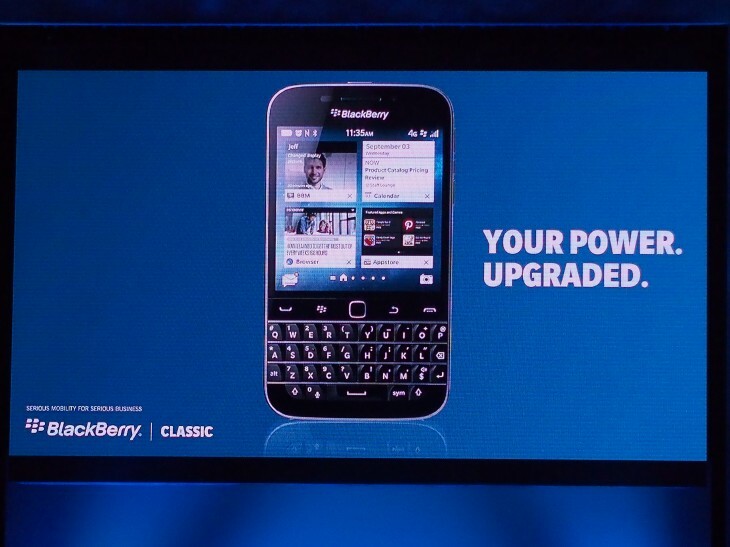 At an event in New York today, BlackBerry announced its newest device, the BlackBerry Classic. Harkening back to BlackBerry’s strongest days of yore, the phone features a, well, classic QWERTY form-factor, running the company’s newest version of BlackBerry OS 10. Like the Passport before it, the phone features a square Gorilla Glass 3 display. The screen is 3.5 inches diagonally, touchscreen-enabled, and comes with a 720 x 720 resolution (294ppi). There’s also an 8 megapixel rear camera, a 2 megapixel front facing one and the usual array of transmitters and sensors. The Classic is running on BlackBerry OS 10.3.1, which comes with battery optimizations to help the phone last up to 22 hours of continuous usage, or about 50 percent longer than the BlackBerry Bold, according to the company. In order to use Android apps not optimized for the display’s unusual aspect ratio. As usual, these apps are available through Amazon’s App Store, rather than the Google Play Store. Of course, you can also install apps through the company’s proprietary BlackBerry World. BlackBerry CEO John Chen says that while the Classic is meant to attract the company’s most loyal users, it also is trying attract newer customers that didn’t grow up on a physical keyboard. The company claims its hardware keyboards are four times more accurate than software ones. The phone features all the traditional keyboard shortcuts you were used to on older BlackBerry devices, which the company hopes will remind users of the productivity available with ample hardware controls. The best part for many, however, will be the return of the Brick Breaker game. The BlackBerry Classic is available for preorder now from BlackBerry.com and Amazon for an unlocked price of $450 in the US, or $499 in Canada. The company expects to have all pre-orders shipped by next week.